Multi-function Wrench - They are the solution to your problems with taps, valves, pipes and wheels. Effective, practical, light weight system. Always Use the Material of the best Quality - Using the CR-V chrome vanadium steel and Chrome plated surface treatment, hardness torque is high, beautiful and durable. Easy to Use - TPR anti-skid handle grip comfortable. Easy to carry. Self-adjusting technology for nuts and bolts of all sizes and shapes. Hardened, Chrome Plated, Durable Quality Tools;Suitable for pipes, spiral pipes, nuts, bolts or other fasteners. 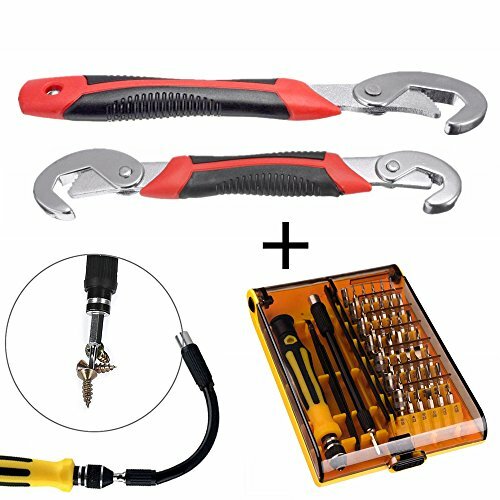 Can be used with all systems of measurement;Quick release clamping, anti slip;Fastens any size bolt, 9-32mm or just flip over tool to undo;The perfect and only tool you need for your cycle or motorbike.